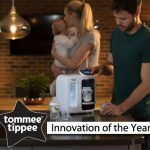 Tommee Tippee is one of the biggest global baby feeding brands, with a vast range of baby bottles, teats, soothers, sterilisers, weaning and food preparation products. It was established over 50 years ago, with its first product being a non tip weighted base cup, which the 2 founding Brothers used in combination with their dog’s name Tippee to name their company. Today, the brand is synonymous with baby feeding products and in the UK is the number one baby feeding accessories brand! Baby Brands Direct is the recommended UK wholesaler to the independent trade for Tommee Tippee products. Trusted and well known for its quality, the market share leader has made available a range of glass baby bottles. Popular with the modern and traditional parent, glass is eco-friendly as it can be recycled and comes from a sustainable material. I t also has the advantages of being naturally BPA free as well as free from phthalates and toxins. The bottles are available in single pack 150ml and 250ml each with secure branded packaging making them even ideal in transport, shop display and for gifting. The bottles each come with a slow flow teat (0 months+) featuring the famous Closer to Nature anti colic valve for more milk and less air, for a more comfortable feed. The teat has been promoted as being just like Mum, with its easy latch design and super soft feel for ease of transition between breast and bottle. Unique to this brand as compared with other feeding brands available for supply wholesale at Baby Brands Direct is that there a glass starter set available. Well packaged and branded, the set contains 3 bottles (a 150ml and 2 250ml), 2 additional medium flow teats, bottle and teat brush as well as 0-6 month soother. 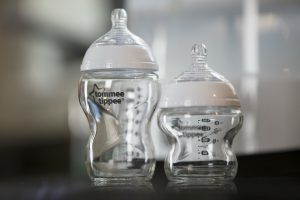 Tommee Tippee has the largest market share by far in both quantity and value of baby soothers (also known as pacifiers or dummies) in the U.K. Hence, all good baby, nursery and pharmacy retailers will be well advised to ensure they have a selection of the brand’s soothers available. In addition, the category leader has recently launched a new style of soother which is more than ever based on their award winning teats and brings a fresh spin and very clear alternative to currently available products. Just like a breast or bottle teat, it curves away from baby’s face that in turn aids airflow and prevents skin irritation. 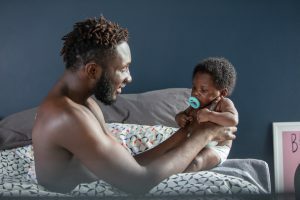 The soother is also orthodontic, as well as being able to flex and stretch with its super soft silicone material for a more natural soothing experience. Being very much like a teat it aids the transition between breast, bottle and soother. It is available in a twin pack of neutral colours in both 0-6months and 6-18months. We also finally have the Tommee Tippee ‘Day and Night’ Prep machine which has additional features to the original prep including soft glow lights that show if your tank needs refilling, as well as down lights on the bottle stand so that it is easier to prepare a feed in the dark and it has volume control for quiet alerts. This version also has a digital display that lights up at the press of the button with step by step instructions. 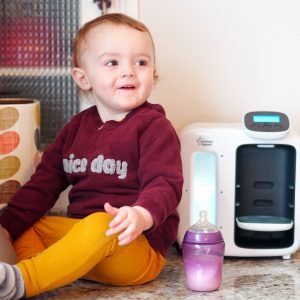 If you are not already stocking the prep machine, the item is dubbed a ‘lifesaver’, as it makes the perfect milk feed in just 2 minutes – yes that’s start to finish, so parents no longer have to wait for the kettle to boil or water for the milk to cool to body temperature, the machine does it all whilst also having added benefits such as an anti bacterial filter and looking pretty good on the counter top. Supply of the Day and Night is available to Baby Brands Direct trade customers in white, black and grey. The original is available in black and white, and the anti bacterial refills (compatible with both), that are expected to last an average of up to 3 months are available in a single and twin pack. So log in to the wholesale portal now and expand your choice to consumers of feeding lines from this multi award winning and leading feeding brand! Retailers without online access will need to register to apply for an account first in order to log in, review prices and place orders. The last 200 new product additions to the trade site can be seen here, and best sellers here (by volume and displayed alpha numerically). Don’t forget to use the resource centre for quick image download and CSV files of new lines and products you have previously purchased.